Radiohead Rare T-Shirt Medium Warp Skam WASTE. Condition is Used. Dispatched with Royal Mail 1st Class. Radiohead ' I Might Be Wrong ' Double Sided Display Promo Flat 12" x 12"
I Might Be Wrong/ Kid A-Amnesiac. Mint Condition never displayed, any creasing in photo is from plastic cover. We will always look to resolve any problems. Radiohead 'Pyramid Song' Double Sided Display Promo Card Flat 12" x 12"
Pyramid Song. Mint Condition never displayed, any creasing in photo is from plastic cover. 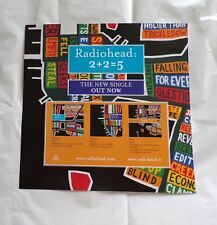 Radiohead '2+2=5' Display Promo Card Flat 12" x 12"
Mint Condition never displayed, any creasing in photo is from plastic cover. Radiohead 'Hail To The Thief ' Double Sided Display Promo Card Flat 12" x 12"
Hail To The Thief/ Go To Sleep. Mint Condition never displayed, any creasing in photo is from plastic cover. We will always look to resolve any problems. Radiohead 'Amnesiac' Display Promo Card Flat 12" x 12"
Condition is l ik e ne w - onlyw or n on ce. Probably unworn, looks in great condition for age. Front print. Good luck! Bought this during the King of Limbs tour at the Manchester Arena in October 2012. I have never actually worn it, and just kept it as a memorabilia piece, but I'm having a clear-out so it needs a new home. Artist: RADIOHEAD. 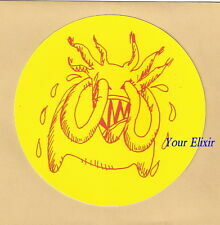 Label: PARLOPHONE. Title: OK COMPUTER. NO COPIES OR REPRINTS SOLD HERE ! Radiohead guitar pick in unused condition. The base is a 4.25x4.25 ceramic coaster which the artwork glued on and sealed with a high gloss sealant that is as waterproof as possible. Do not run these through the dishwasher as they will be destroyed. THE COLOR IS ROYAL BLUE. THIS SHIRT FEATURES A RAISED VELVET FELT TYPE LETTERING. VERY UNIQUE. Display stands are not included unless otherwise noted. RADIOHEAD - KID A - ORIGINAL DS RECORD PROMO POSTER #1 - 18" X 24"
This is an official shirt and it is an adult size extra large shirt. The Man, Kasabian, Courtney Barnett, Misterwives, Fidlar, The Rubens, Real Estate and other similar artists! MIX & MATCH! New listingRadiohead / Original Vintage UK Poster / #pp0822 / Exc. New Cond.- 24 x 34"
Radiohead / Orig. Size approx. RADIOHEAD - KID A - ORIGINAL SS RECORD PROMO POSTER #2 - 18" X 24"
Rare ticket from the above concert. FRONT: RADIOHEAD 7/11/18 NEW YORK CITY GRAPHIC. SIZE: EXTRA LARGE / XL. LIMITED EDITION DATED 7/11/18 NEW YORK CITY MADISON SQUARE GARDEN T-SHIRT. NIGHT 2 OF 4 SOLD OUT SHOWS. BONUS: WILL INCLUDE MADISON SQUARE GARDEN BAG ! 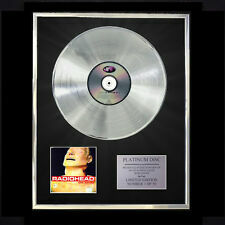 RADIOHEAD THE BENDS CD PLATINUM DISC RECORD AWARD DISPLAY VINYL LP FREE P+P!! • This Award Disc contains the ORIGINAL CD Disc taken from the Album and is presented against a high quality jet black matt mounting. Then this Award Disc will look GREAT on the wall! • We Can tailor make virtually ANY Award Disc for you. Do you have a favourite album or artist?. THE COLOR IS BLACK WITH THE RADIOHEAD WORDING IN RAISED VELVET OR FELT TYPE MATERIAL. THE SIZE IS; XL, EXTRA LARGE. OK Computer and. output jack. Each print will be signed and individually numbered by hand in soft pencil by the artist prior to despatch. Size 420mm x 297mm (16.54" x 11.69"). ed by the pickup selector. 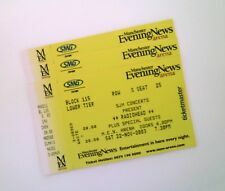 THE COLOR IS BLACK WITH THE RADIOHEAD WORDING IN BRIGHT COLORED LETTERING. THE SIZE IS; XL, EXTRA LARGE. Radiohead very Limited concert poster 24x36 purchased at event only. See pics for over all condition. Poster is new never hung or displayed. No dents or prominent cresses to surface. Clean no finger prints and smoke free environment. Poster will remain rolled in tube for shipping. Price is set. Thanks. THIS PIN IS IN UNUSED MINT CONDITION. Very nice and collectible promo print of Radiohead'sHail to the Thief album artwork (by Stanley Donwood). Very cool and very rare! It was signed at a show in Brisbane, Australia in 1998. The cover has a crease down the middle and is a bit tatty on the back. 2000 Radiohead Kid A Columbia Records PROMO only MIRRORED POSTER - ULTRA RARE!! THESE SOLD OUT FAST AT THE UNITED CENTER. Note i have 2 of these available. You are looking at an original W.A.S.T.E Catalogue from 1997/98/99. The band used to send these out after the release of OK Computer. Each card has its own unique design and language. Contents Include.